Then a good friend Christine (Hi Chris!) took up ‘ukulele. She encouraged her friends to do the same (join us, join us, join us!) I signed up for a Laneway Learning class, bought a ‘ukulele at my local music shop and went along. The teacher Harry had the whole group playing a song and singing along in one hour. I was amazed how easy it was to start. Harry had mentioned his weekly ukulele group, Yarra YUkers. So I turned up to check that out. Half way through the session I was playing, singing along and grinning from ear to ear. No pretension, just a solid bunch of people playing and having fun. Afterwards I felt ecstatic. Maybe I could actually play a musical instrument! I had fallen under the ‘ukuleles magic spell. 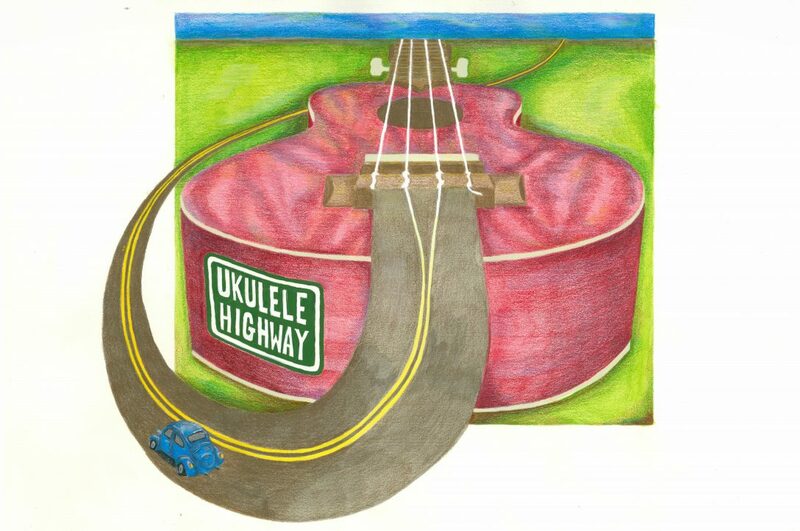 End of September the first episode of Ukulele Highway will be released. I can almost see it in the distance. I’m looking forward to learning from co-hosts and guests everything there is to know about ‘ukulele. I hope you enjoy the journey too. Now I’ve shared my journey to ukulele, will you share your story with me and other readers? I’d love to hear from you. Post in the comments section…. Next Post Ukulele Highway Podcast co-host Ep1, Dr Andi, Four fingers and Four Strings. Yee Haw!